We find that one of the areas that our customers find most difficulty with is the choice of the leather finish second only to the final colour choice. 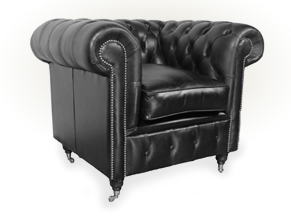 When people visit us having looked through the pages of our website, the choice of club chair or wing chair is something that they have already may have decided. The choice of leather is, however, another matter and there are some points that you should take into account when choosing. The general décor of the room, what sort of use will the club chair be put to, for instance would it be in a home or perhaps a hotel reception area or perhaps a bedroom. These factors will influence the choice of leather finish for your chair. Traditionally a club or wing chair would be upholstered in antique green, antique red or antique brown, but by no means would this be the limit of your choice and again, depending on its location a brighter colour can not only transform the chair as well as the room. Often an unlikely colour such as white can supply a focal point for a room and in premium leather is not difficult to keep looking pristine. If you are looking for a more rustic look to a traditional setting hand dyed leather in a chestnut colour can give a club chair such as the Cumberland a special look. At club-chairs.co.uk our Antique leather is a durable, corrected grain leather which is hand antiqued after upholstery by partially 'rubbing-off' the darker coat on top to reveal a brighter traditional colour underneath. For over a century this type of leather finish has been used for over a century to give a club chair that deep, lustred finish. For an entirely different kind of leather and one which offers a range of colours that are second to none Premium leather finish may be the one that would tick all the boxes. This leather is referred to as a semi-aniline pull up leather which is hand creamed and moisturised after upholstery by hand to give a super soft finish. As this leather is the most natural you should expect this to show creases and distressing in your club chair, but over time and with use, if you have more than one club chair they will each have their own unique patina. Hand Dyed leather is a fully aniline leather and it is by far and away the most exclusive of finishes for any club chair and is usually found on the more exuberant of models. The leather is hand dyed and buffed to a very smooth and deep colour finish.